When I was wee we called them macaroons, but I’m going with the zeitgeist and will refer to them as macarons. Whatever you call them, they are the most scrumptious light almondy sweetie bonbons you will ever come across. 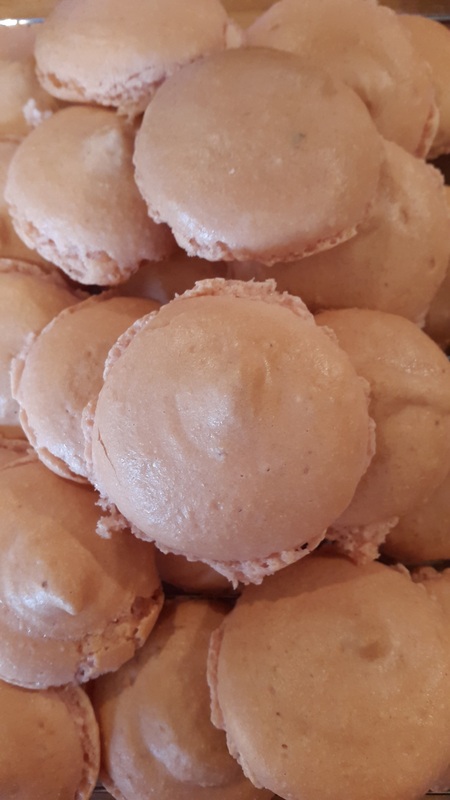 I always had this idea that macarons were tricky to make, that they wouldn’t rise properly, that they would just be too solid and not light and airy like they should be. Or that they’d be dry and crunchy instead of deliciously softly moist. So, what changed my world view of macarons? Firstly it’s that I love them, and wanted to be able to make them. But mostly it was getting chickens. And then once we had so many eggs, I started making my own mayonnaise. And once you make your own mayonnaise you have a plentiful supply of egg whites. And I don’t like meringues much, so macarons were the obvious solution. Don’t you love your life when macarons are the obvious solution!! To make these properly you need a few bits of kit. For starters, a food processor. You know, the kind that whizzes round and round and chops everything up really fine. You’ll also need a piping bag with a large plain nozzle. And your life will be a whole lot easier if you have either a food mixer too to whisk the egg whites. Before you start, get your piping bag ready with the right nozzle in place, and prepare your baking tray (I line mine with non sticking baking parchment, but you could use rice paper, or a re-useable silicon mat). Put the egg whites into a scrupulously clean bowl (any hint of anything greasy and you will have a FAIL), and whisk them until you have soft peaks. Gradually whisk in the caster sugar, and get it all glossy and thick and gorgeous. At this stage I whisked in a few drops of orange essence. Now get yourself a big metal spoon (or a spatula) and fold half of the sugar/almond mixture into the egg whites. Once they are combined, add the remaining sugar/almonds and fold them in to make a light smooth mixture. Don’t over mix or you’ll lose all the air, but try to get rid of all the lumps. Spoon the mixture into the piping bag and pipe even sized circles of macarons mixture onto your baking tray. Turn the oven on: 140C or GM3. Now leave the tray of uncooked macarons at room temperature for about 15 minutes so the surface dries out ever so slightly. Bake for 15 minutes, then leave to cool still on the tray. 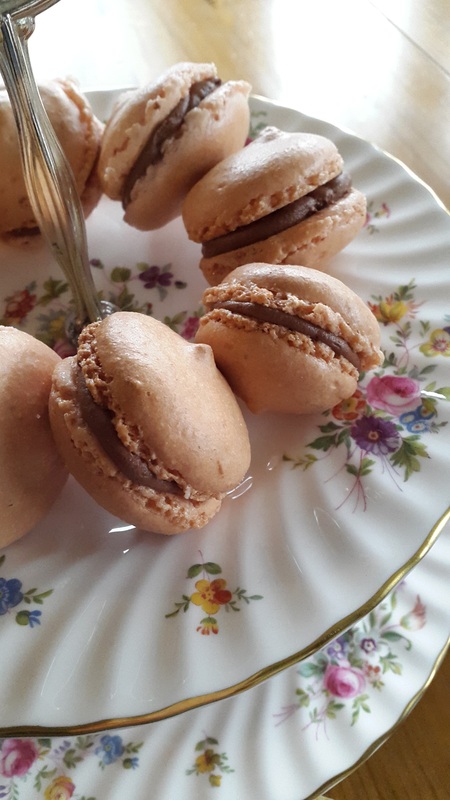 You know what to do now.. spoon (or pipe) some chocolate orange filling onto half of the macarons. And pop a second macaron on top of each, to make lovely macarons sandwich. YUMMY.